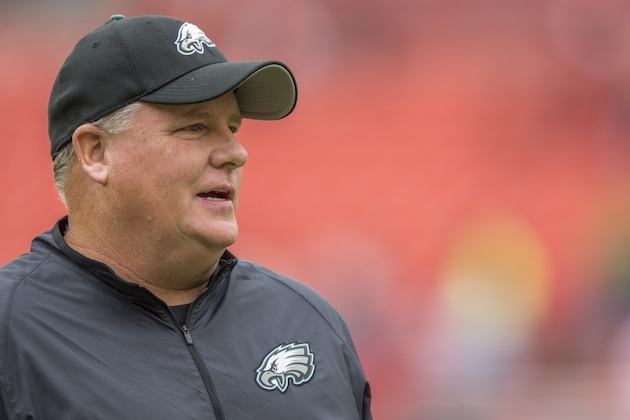 For a while, it looked like Chip Kelly's up-tempo offense would form a new NFL template. But emphasizing pace has since come back to haunt the struggling Eagles, who look for a statement win Monday night against divisional rivals the New York Giants. Elite NFL teams can win many ways. This year’s Eagles, however, have no such luxury. When the Eagles are clicking, like they did in the second half of their Week 5 victory over the New Orleans Saints, when they scored 29 points in the final 30 minutes, they look like a well-oiled machine. And as they proved against the Falcons and Redskins in Weeks 1 and 4, respectively, their high-tempo assault can make a double-digit deficit disappear in the span of a quarter. It's what Chip Kelly's offense is designed to do. Heading into their Week 6 matchup against the New York Giants, the Eagles were averaging the second fewest number of seconds between plays, according to Football Outsiders, trailing only the Houston Texans. 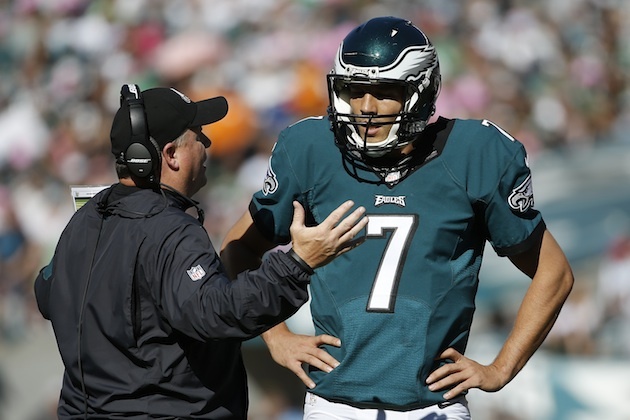 Unfortunately, when the up-tempo Eagles can’t extend offensive possessions, Kelly’s entire machine grinds to a halt. Through the first quarter of the season, Kelly's offense sputtered repeatedly, creating a downward spiral that's affected the defense, too. When a fast-paced offense consistently (and quickly) fails to advance the football, the results are poor. Since 2011, NFL teams with a time of possession below 20 minutes in a game have gone 2-19, per Pro Football Reference. Under Kelly, Philly has had six such games, which leads the league in that span. In fairness to Kelly, time of possession doesn't necessarily correlate to plays run in his system, but when it becomes that unbalanced, it's indicative of a significant problem. This season, the primary problem has been the Eagles' offensive line. The O-line's subpar play has been a major factor in the team's early season inconsistency, highlighted by an at-times woeful running attack. And while center Jason Kelce didn't directly blame his unit's poor play on Kelly's decision to jettison two of the group's veterans during the off-season, he wasn't shy in taking the brunt of the blame for the Eagles' disappointing 1–3 start. "Bottom line is our defense plays good enough, our offense struggles to move the ball when we don’t do our job, and that’s been the thing from the f------ beginning of the season,” Kelce told reporters following Philadelphia’s 23–20 loss to Washington in Week 4. 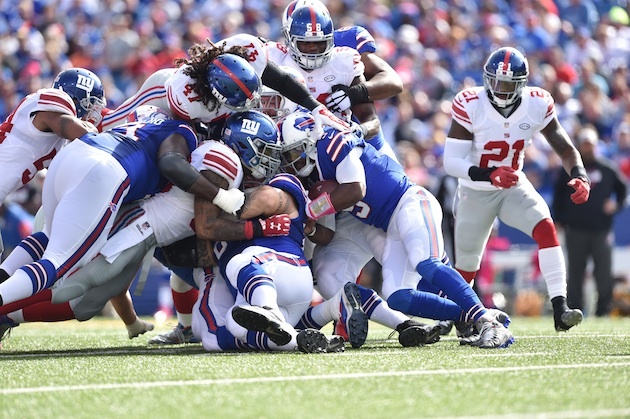 “That’s been exactly what stalled out our offense from the beginning all the way through these first four games. And right now we don’t run the ball when we need to, we don’t pass block when we need to, and it’s a disgrace right now." According to Pro Football Focus, Kelce was right. Through the first quarter of the season, the Eagles’ pass blocking ranked 19th in the league, while their run blocking was 23rd, which helps explain why Philadelphia had the league's fourth-worst rushing attack, per PFF’s data. There isn't an easy fix, either. The Eagles have just a single healthy offensive lineman with a positive grade in run blocking, as ranked by PFF through Week 5. Kelce ranks 26th among 35 qualified centers, while Allen Barbre is 74th out of 77 qualifying guards. Andrew Gardner, Philly’s best ranked run-blocking lineman, suffered a foot injury during the Eagles’ Week 3 win over the New York Jets, and has since been placed on injured reserve. Though the line performed much better against the Saints in Week 5 — even with starting tackles Jason Peters and Lane Johnson banged up — there’s reasonable concern about whether that production is sustainable. The Saints have the league’s worst-ranked pass defense and 18th-ranked run defense, according to Football Outsiders, whereas the Eagles’ Week 6 opponent, the Giants, enter the contest with the league's second-best run defense. If Philly’s run game begins to sputter against New York, Kelly needs to consider tapping the breaks on his up-tempo scheme. If the Eagles' offensive line isn't making any holes for the running game, and then not giving Bradford enough time to make plays (against a modest Giants pass rush) on third and long, Kelly may see his defense on the field for 40-plus minutes again. If that happens, it will probably only be a matter of time before Eli Manning figures out how to pick it apart— a common theme that has played out during the Birds' first four games this season. The Falcons, meanwhile, controlled the ball for nearly 20 minutes in the half, opening a 20–3 lead. Philadelphia came surging back in the second half, but Cody Parkey’s shanked field goal attempt went wide right, and the Eagles’ ensuing last-gasp drive ended with an interception after bouncing off wideout Jordan Matthews’s mitts. The following week against the Dallas Cowboys, Philadelphia controlled the ball for just 19:35, running 55 plays to Dallas’s 70. The Eagles finished with a ghastly seven rushing yards on 17 attempts as Cowboys defenders plowed into the backfield with reckless abandon on just about every snap, leaving DeMarco Murray, Ryan Mathews and Sproles with little chance of turning a positive play. Once again, the Eagles’ opponent controlled the ball for upwards of 20 minutes in the first half, opening a 13–0 lead. Again, the Eagles came back in the second half, notching touchdowns on the first two drives — but a three-and-out midway through the fourth quarter gave Washington the opportunity to drive the field for a game-winning score. Considering the Giants are allowing opponents to rush for just 80.6 yards per game, and 3.5 yards per attempt, there’s reason to wonder whether Philadelphia will experience the same type of running success that it did against the Saints, when they ran for 186 yards. A poor defensive call on a run play can happen at any time. But players getting sloppy in their technique? That sounds like exactly the thing that would happen with fatigue. You get tired, you get careless. And when you lose a step or two of speed — remember, we’re talking about 300-pound men in some cases — that can translate into missing an assignment or failing to fill a gap. Kelly has made famous the notion of, “We’ll win with whomever we have.” His work, going back to his days at Oregon, showcases that belief. In Chip’s mind, the system will win out. That was all well and good at the college level, but in the NFL, stubbornness often masquerades as ignorance. If Kelly's offense is not getting the desired results, in part because of personnel decisions he made, he needs to do something about its tempo in order to help out his frequently exhausted defense.